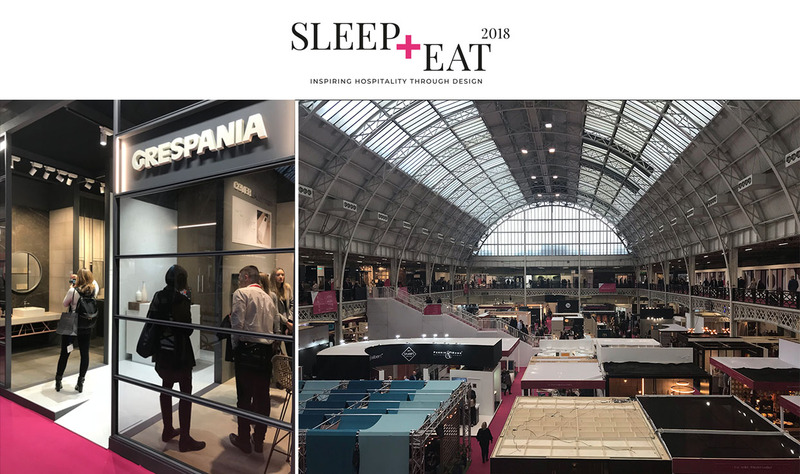 We here at Grespania would like to thank attendees for their enthusiastic reception at Sleep +Eat London. Once again, visitors to our stand were able to enjoy the range of possibilities the Grespania Group provides within the field of interior design and hotel architecture. To start with, there was the line of large-format Coverlam, available in multiple sizes, thicknesses and finishes. Next was the Coverlam Top collection, a line of ultra-resistant porcelain in thicknesses of 10.5 mm and 12 mm and 1000x3000 mm and 1620x3240 mm formats, specially developed for use as kitchen countertops due to its unbeatable resistance and durability. Special mention also goes to the line of unglazed technical porcelain tiles that have so much to offer in terms of design and innovation. For example, the Montreal series, with its different finishes, formats and thicknesses, is a product that ensures aesthetic continuity between floor and wall tiles, as well as between interiors and exteriors. As such, it is an excellent solution for designers and architects. Grespania comes away from Sleep+Eat London having positioned itself once more as a company with strong ties to the hospitality equipment sector. 32 sql / 6 sqlseo / 0.27361202s.